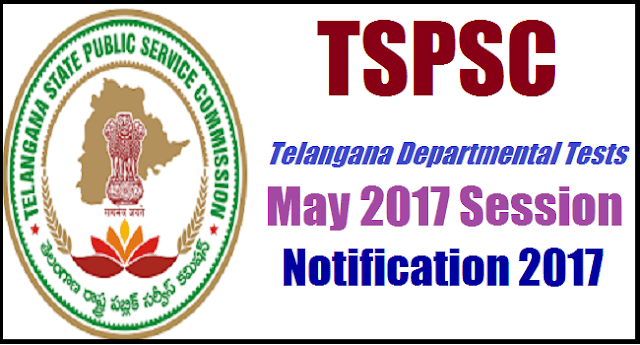 TSPSC Departmental Tests Notification 2017 - May 2017 Session Notification 2017: As per the Public Service Commission Regulations, Telangana State Public Service Commission conducts Departmental Examinations for employees working in various Departments under State Government of Telangana. The Commission conducts Departmental Examinations twice a year i.e., in May and November for the promotions to the employees.Applications are invited On-line from the employees of Telangana State through the proforma made available on the Official WEBSITE of the Commission http://www.tspsc.gov.in for Departmental Tests May -2017 session clubbed with November– 2016 session scheduled to be held from 09/09/2017 to 14 /09/2017 at the District Head Quarters of Telangana State. The Tests will be held in accordance with the T.S Departmental Test Rules – 1965 adopted vide G.O.Ms.No 191, General Administration (Ser. C) Dept Dt: 27-05-2016. The desirous candidates may apply ON-LINE by satisfying themselves with the terms and conditions of the notification following Department Test Rules, and subsequent amendments to the Rules made from time to time. Hand written / Typed / Photostat copies / printed Application forms will not be accepted and such applications are liable for rejection. The Departmental examinations are held at ten (10) District Headquarters including Hyderabad. The candidates are admitted to the District Centre concerned where the candidates are presently working. #TSPSC is going to release the Departmental Tests May 2017 Session Notification 2017 released in May. This notification details as follows. The Telangana State Public Service Commission will conduct the Departmental Tests Examinations (Objective Type) vide Go.Ms.No.602 GA (Ser-C) Department, Dt: 01/11/2011 and few Tests are written examinations as mentioned under Para 5 (h) at (10) District Head Quarters and in Hyderabad for May, 2017 Session from as per its new schedule / as per the Time-Table shown in accordance with the terms and conditions as laid down in Departmental Tests Rules, 1965 and as amended from time to time. The Telangana State Public Service Commission (TSPSC) would invite the online applications from the employees of Telangana state for May 2017 Session Departmental Tests examinations scheduled to be held from as per new schedule/time table at District Head Quarters of Telangana State including Hyderabad (Ranga Reddy District clubbed with Hyderabad). b) As mentioned above, the applicants should pay Rs.50/- towards application fee in addition to the examination fee of Rs.50/- for each paper, payable to the Secretary, T.S. Public Service Commission, Hyderabad through Net-Banking/IMPS/Debit/Credit Card from 18/07/2017 to 31/07/ 2017.
ii) IPOs / Demand Orafts are not accepted. II Step: Immediately on entering the above details the Applicant will get Challan Form to pay the Fee at State Bank of India /TS Online centers. III Step: The Applicant should pay the prescribed Fee in any one of the State Bank of India /TS Online centers and obtain Fee paid challan with Journal Number in the first instance. V Step: Those candidates who need assistance of Scribe are requested to apply for the same directly to the Commission. They should mention the Application ID Number and enclose Copy of the Medical Certificate along with a representation. h) The duration of tests of objective type & descriptive type pattern is as per the G.0.Ms. No.288, GA(Ser. c) Dept., dt:10/09/2014.